Radish seeds from your public library? Morro Bay, CA — Yes, you can get radish seeds from our library. And for other plants of other kinds, would you believe? My, how libraries are a-changing! In the long history of libraries, this is a first, I believe. So, wonder what will come next? What’s this? I thought. Sounds wacky! I’m a regular at the library. It has a remarkable variety of wonderful services. I couldn’t imagine another. I saw no need. Especially one as exotic as this. We’re part of the San Luis Obispo County library system headquartered in the lovely city by that name. It has 15 branch libraries. Mary told me that for now the seeds will be offered in five branches. Then they’d see. Oh, by the way, our population here is 10,600. 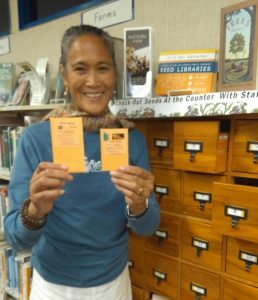 Our library has 3,750 members with library cards. Quite impressive. That says a lot. Librarian Victoria with seed packets. Choose the ones you want. Good luck!!. She led me to an alcove. There was a wooden file cabinet there. The kind libraries had before computers. They must have dragged this sturdy old beauty up from the basement. You remember those, I’m sure, with drawers jammed with 3 x 5 cards. The cabinet was the heart of a nice display. A sign up on top said SEED LIBRARY. Around it had been set up interesting display of books about seeds and planting and harvesting . She opened a drawer. I could see lots of small packets. Each held seeds. I started firing questions and she had the answers. It was clear she thought the seed library was a great idea. It stocks 160 kinds–vegetable, berry, melon, flower, herbs, shrubs, grains, and trees. Over 200 packets have been checked out, she told me..
What’s interesting is never frost here. There are three growing seasons. Different plants are appropriate for the three seasons. People can choose the seed packets they want. They are free. Now remember the three steps– Plant / Save / Share. The gardeners must intend to plant them. Not waste them. Enjoy their harvests. And share, meaning bring back seeds for othes to plant. She nodded. “Yes, of course. But we don’t insist on getting seeds back. We do hope they’ll get in the spirit of the program and bring back whatever fresh seeds they can. Excellent. But for sure I’ll never check out any seeds. I’ve never planted anything. Not even radishes, which I’ve heard are one of the easiest. But gardening IS popular, so I understand the appeal. She handed me a folder. “Seed Saving Basics.” Published by the San Luis Obispo Seed Exchange. Their goal is to get more people to plant seeds and garden. How to promote that goal? 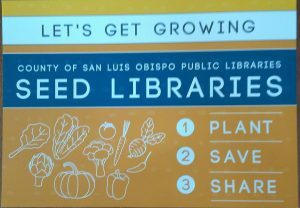 They got the great idea of collaborating with the SLO Libraries, and here we are. Later I found it easy and interesting reading about what is a technical and wide-ranging topic. So yes indeed, libraries are changing, and in remarkable ways. To my thinking, the library is no longer a library. It’s a true community center. All the traditional library services, but so many more. You must have noticed this at your library. But of course they go mostly to check out books and movies and other items. Also to use the free computers or connect their laptops to free Wi-Fi. To read books and magazines and newspapers right there. And take advantage of other services. For instance, every Thursday morning, Diana, a librarian, shows people how to use a newly acquired cell phone or tablet. Every week someone from outside comes in to give a lecture or demonstration. For example, one recent Saturday I sat in on a demo by the Shanks String Quartet—four young symphony members, all brothers, which I found remarkable. Each had a different kind of string instrument. They showed us the features of each and then performed together. They played bits of classical pieces, popular, even African. Fantastic, I thought. Wonderful! On another Saturday, Dan Krieger, a retired history prof at nearby Cal Poly (the California Polytechnic Institute) gave a superb talks on “Ranchero Days”—the early Mexican farmers who were among the first settlers here. In fact yours truly will be speaking soon, on how volunteering in the Peace Corps can be terrific, whether you’re young, middle-aged, or retired. As some of you know, I’m a former Volunteer. I served in Ukraine, in fact turning 80 in Peace Corps and becoming the oldest of some 7,800 Volunteers working in more than 75 countries. My mother loved to read. For sure she’d have a Morro Bay Public Library card in her pocketbook! She and Papa were immigrants from French Canada. We lived in Pawtucket, R.I. and I was born there, their first child. We spoke French. I started to learn English when I went out and played with the neighborhood kids. Pa went into business and slowly picked up English. Maman was at home, like every other housewife with kids back then. She loved to read in her limited spare time. French novels. And the weekly paper that came down from Montreal. And gradually the daily Pawtucket Times that we got. And she got to read English quite well. Then she discovered the Saturday Evening Post. When it came every week, she’d drop everything and curl up with it for 20 minutes or so. Then force herself back to doing the laundry or whatever. After Pa and we kids went to bed, she’d stay up late with her wonderful Saturday Evening Post. When I was about 12, one day she took me downtown on the trolley. It was a weekly thing, you know, to shop. But this time, she took me in hand and we walked to the city’s Slater Memorial Library. Maman took me up the granite steps and through the big bronze doors. This was all new to me. She showed me around. The stacks with shelves and shelves of books. Then into the periodicals room. Magazines. Newspapers. Even the small section with kids’ books. Then took me to the main desk and got me a library card. My very first. She even helped me check out a book. Sorry, I don’t remember the title. And I too became hooked on reading. That library card became precious to me. And know what? I have never been without a library card. That was more than 75 years ago. Certainly a library card has been one of the most wondrous things I’ve ever owned. Of course I keep my Morro Bay card in my wallet, ever ready. The fact is I have become a denizen of libraries. A connoisseur, too. I have been in countless libraries. Grand ones such as our magnificent Library of Congress in Washington. Do you know it’s the biggest in the world? And the splendid Royal Library in London. I had to show my passport but got into only one small section. And the justly proud Bibliotheque Nationale in Paris. But I had to pay an admission fee. And the impressive libraries in Shanghai and Hong Kong, free and wide open like our libraries. Or the also grand, million-book Korolenko Library in Chernihiv, Ukraine, where I served my hitch as a Volunteer. But what a surprise. It consisted of 18 small libraries, arranged by genres…novels, history, sciences, philosophy, music, math, and so on. First, you had to go to the huge master card catalog. It filled a whole room. Poke through and jot down the info for each book that you wanted on a card. Just one book or three or four. If you wanted books on several genres, you had to go to the appropriate sub-libraries and check out the books individually from each. You could not enter the stacks. You’d show the right card or cards to the genre librarian. She’d fetch them for you. Could not go in there to see if other books, maybe better, might be available. Then you’d have to go on to the next sub-library, maybe on another floor, and so on. It could take you a couple of hours. I’ve visited libraries in many of our states, and in some more than one. And at least a dozen countries. Memorable libraries, such as in Montreal and Honolulu and Lisbon in Portugal and Guadalajara in Mexico and Cairo in Egypt and Hanoi in Vietnam—the only one, by the way, where I was not allowed in. I have been in libraries where I have had to pay, as in Paris. I have been in libraries where only certain people were allowed to take out books…and I was not one. I remember visiting the big library in Nairobi in Kenya. It had great Corinthian columns which made it look like a Roman temple. For sure, folks there were very proud of it. But so many of its books were in terrible condition. Worn. Tattered. Some coming apart. You know, we have so many discarded books here in the U.S. that we trash them. That’s true. If only we could ship them to libraries in poor countries. They’d be considered a godsend. Sure, they’d be in English, but many people in other countries make it a point to learn English. But the shipping expenses are prohibitive. So I’ve been told. I remember a tiny library in a tiny town in Alaska. Smaller than a one-car garage. Open only a couple of afternoons and evenings a week. I remember the library in Mazatlan, Mexico. Also in a proud building but with pitifully scant offerings. I learned long ago the best libraries in the world are ours. Having a library for the public was an inspiration of the incredible Benjamin Franklin He created the Philadelphia Public Library, which was the first. I’ve had the pleasure of visiting it. All based on principles that he developed and we take for granted and believe prevail around the world. Hah! To be supported by public Free. Anybody can enter. Nobody will be checked or refused. All circulating libraries—you can check out books to take home. Open stacks! Carnegie insisted on that. Unknown until then. I wish the Korolenko had heard of him. And of course, reading rooms to sit and read and study and write in a safe and comfortable environment—heated when heat was needed. With trained librarians who would be genuinely helpful, with wide assortments of books and periodicals, and with ridiculously small fines for late returns and reasonable charges for lost books. And with hours of use convenient to patrons with different working hours. Stay all day if you like. And, oh, with toilets and free hygienic supplies, unheard of before then. And in time free parking, often in off-street parking lots. Most important of all, the brilliant Dewey Decimal System, making finding any book easy. In many communities, open seven days a week, closing only for holidays, with day and evening hours. All of which we take for granted, but are rare in so many countries. And I saw the improvements one by one come to libraries. Amazing the list. Here they are, as they pop up in my memory. Free search help. Trained children’s librarians. Free use of computers. Computers in the children’s section. Wi-Fi —come in with your own computer, connect, go to it, all free. Self-checkout. Free inter-library loans. Scanners and photo-copying machines with low-cost copies. Home delivery to the ill and house-bound. Reserving books online. Receiving online alerts of books and items due back. E-books. CDs. DVDs. And new innovations all the time, such as the seed library. Long ago, by the way, in my extensive over-the-road travels crisscrossing our country, I figured out a quick and easy way to size up a town or small city. I’d ride up and down its main street and then one or two major ones, turn off onto a side street here and there, and visit its library. That would tell me a whole lot. One of my most wonderful experiences was in my recent home state, Connecticut. Some 15 years ago I was driving back from a long trip out of state. Back in Connecticut, I stopped in the city of Danbury for a break. Some 80 miles from my home in tiny Deep River. I strolled into its library, my first time there. Browsing new books, I found one very appealing. Maybe my small Deep River Public library would have it, but maybe not. A librarian told me that if I had a Connecticut library card (which I did), I could check it out. But then I’d have to drive back to Danbury to return it. Or mail it back. No! No! I could return it to my Deep River Library and it would return it to Danbury. So how much would that cost? Free! And that was possible in any public library in Connecticut. Wouldn’t you find that amazing? And that’s how I got to enjoy that book. Now that I think of it, some 60 years ago I was a trustee of the public library in Auburn, Mass., where we lived then. The first time, the only time, I ever ran for public office. I thought at our monthly meetings we’d talk about books, well, a bit. It never happened. It was all about how to lower our heating bill, extend the janitor’s hours, afford some new furniture. I did not run for a second term. Here in Morro Bay, I asked Mary, as you know, our head librarian, what services were most popular. Of items checked out, she said DVDs were number 1, Adult Fiction number 2, Juvenile Fiction 3, Adult Non-Fiction 4, CDs no. 5, Books on CD 6, Juvenile non-Fiction 7, Book Club In a Box, 8. There are other take-outs also, right down to video games and Chrome books. Those are items checked out. To my eye the most popular service in the library is the free use of its computers, and second the nice selection of newspapers and magazines in the periodicals room—magazines can also be checked out. by the way..
Popular is its used-book store, sponsored by its Friends of the Library members. It has a stock of several hundred books on sale, all good quality. Most of them for just $1, and late-issue magazines for just 50 cents. Four times a year, always on a Saturday, it holds a Book Sale. Thousands of books are offered, all organized by genres and offered at low but different prices during the morning, and in the afternoon, you can rush around and fill a grocery store paper bag for just $3. People stand in line to wait for the opening bell. Staging those quarterly sales is a huge job, all the work of the Friends. These quarterly sales are a great fund-raiser — thousands of dollars every time. But many libraries across the country do this but mostly annually. Yours probably does. For sure despite our incredible, phenomenal digital craze, books ain’t going out of style. But hey, I may be wrong. I just remembered an article I wrote just four years ago. About the world’s first digital library! It’s the Bexar County Digital Library in Texas, close to San Antonio. It’s called the BiblioTech. It looks futuristic and was designed and built just for the purpose. BiblioTech sounds strange, doesn’t it? Well, it’s a marriage of books and technology. Not a single paper book or magazine in it. It’s filled with digital books—just e-books and DVDs and such. So instead of bookcases and such, it was stocked with $178,966 worth of tablets, iPads, iMacs and MacBooks, e-book readers, 10,000 e-book titles, and other goodies bought from Apple of course. All its services are free to county residents. There are on-going classes on how to get the most out of these digital items. Many can be checked out. Even tablets and computers. Some were calling it the library of the future. Which suggests the demise of libraries as we know them, doesn’t it? Hey, I’m not going to lose sleep over that. I’ll never see it but maybe my grandchildren will. But I believe in progress, so I do have to think that this is a good thing and will be the future of public libraries. Who back in Model T Ford days ever thought that just one century later we’d have driverless cars? For another bit of perspective: I never dreamed one day I would own a smart phone. Sounded crazy. Now I have one and I can’t get by without it. So yes, libraries are a-changing. But they always have been, and always will. You know, the way I see it, if Heaven is really heaven, there’s a public library up there. I’ll sign up for a card the day I arrive. I doubt they’ll have free seeds, though.